History/Mythology: Gold Quartz is formed due to the partial or total covering of a layer of yellow/orange/red/black caused by iron oxide. They are renowned for their healing properties and as points very rare! Golden Quartz or Golden Healer Quartz are renowned for their powerful healing properties and are coveted by healers and energy worker. 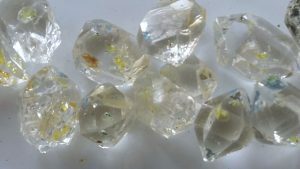 Golden Quartz will help you to make and they maintain your contact with higher vibration beings so that healing can be commenced on all levels. Golden Quartz helps you to recognize the reason for the illness, initiate recovery from the illness and recover from the illness. Golden Quartz is a very grounding and balancing stone. Healing – Helping on all levels. Wonderful as a healing tool and should be in any energy workers kit. Great to carry around as a hand comforter.